Charles Dickens' A Christmas Carol has been recreated in many forms from Bill Murray's Scrooged to the musical version with The Muppets, but this new stage version adds another dimension that brings the author's concern for social injustice to the fore. True to the very nature of Charles Dickens as a campaigning writer, this new adaptation for the Royal Shakespeare Company (RSC) is deeply emotional with a heavy social conscious. It runs at the Royal Shakespeare Theatre in Stratford upon Avon until 4 February. For at its heart, this gripping production adapted to stage by David Edgar emphasises the injustices that Dickens wanted to be noticed in Victorian England. Forty years ago, Edgar was behind the renowned adaptation of Nicholas Nickleby and he has once again made excellent work of bringing a Dickens' classic to life, this time for a 21st Century audience where poverty and class issues still resonate. It's not all doom and gloom as, after all, this is a play to bring joy for the season. 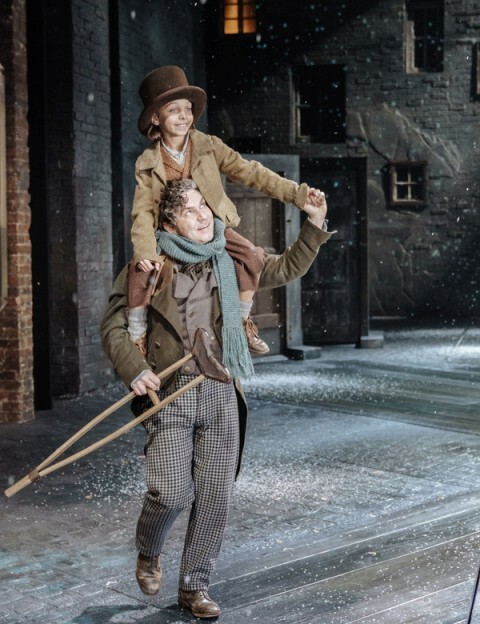 There are streams of comedy flowing through the lively script and much of that comes from the added dimension of featuring a young Charles Dickens in fictional arguments with his editor while writing this Christmas play. Opening cleverly with Dickens arguing with his editor John Forster, about how he wants to write about child labour in the factories rather than a happy novel, allows the audience to hear a little about the harsh conditions of the times. It sets the scene for what is to come with this play doing what many other versions have avoided - shining a light on the political commentary that Dickens made about the plight of victims of the industrial revolution: from the lace makers to those trapped in the workhouses. From here the audience is transported into the story Dickens is writing, where moving doors recreate Scrooge's office and smoky special effects and lighting give the impression of ghostly goings-on. 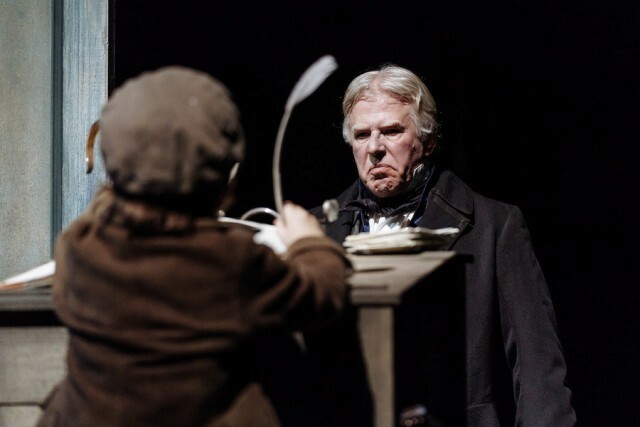 Director Rachel Kavanaugh, who was Artistic Director of Birmingham Repertory Theatre for five years, keeps the action flowing and has a perfectly-cast Phil Davis in the key role of Ebenezer Scrooge at her disposal. Rather than a gruff cockney that he's played many a time for TV and film roles from Bleak House To Whitechapel, this distinguished, versatile actor plays Scrooge with more panache. 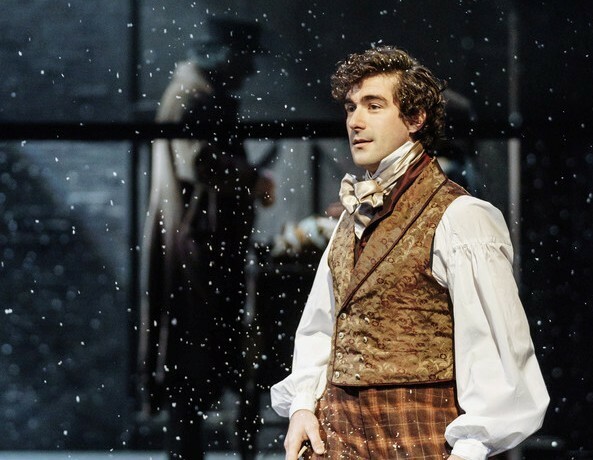 Davis makes an exceptional RSC debut and is a delight to watch whether grumpy or childlike with excitement when revisiting happier times in Scrooge's youth. He's got a twinkle in his eye too when delivering grouchy one-liners. Davis was simply made to play Scrooge. As Scrooge goes on his journeys through Christmas past, present and future, he is accompanied by refreshingly modern ghosts. Vivien Parry as the Ghost of Christmas Past is a touchy-feely counsellor, repeatedly asking Scrooge "but how does it make you feel?". While vibrant Brigid Zengeni plays Christmas Present as a memorable, gluttonous and ravishing exuberant force to be reckoned with. There's much to make you feel festive and thankful in the production and the most joyous scene comes during Scrooge's time travel to the past when his former boss Mr Fezziwig hosts a Christmas party. Welcoming guests with names updated for modern times, like Mr Tinder, Mr Uber and Mrs Snapchat, there's much to revel in as the singing and dancing on stage spread goodwill and sentiment throughout the theatre. John Hodgkinson is particularly good as larger than life, kind-hearted Fezziwig. There's great use of children in this production too. 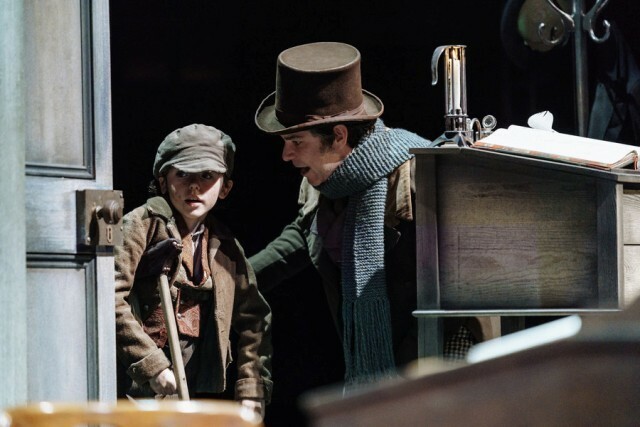 Tiny Tim is an adorable urchin who pulls at the heart string (Three young actors are sharing the role and I saw a very talented Jude Muir in the part on press night). There's also the shadow of two impoverished waifs emerging from factory gates as solemn facts and figures are recounted about child labour in Birmingham's Victorian era. It's hard-hitting stuff. Even the Cratchit family meals are loaded with solemn insights into how bleak life is for Tiny Tim's siblings, whose prospects as dressmakers or factory workers are tinged with long hours, little wages and tough conditions. It's all done in a carefully crafted way that gels in with the plot, so that it plays on your emotions. But don't fear that this version is heavily weighed down with social welfare protests, for it isn't. 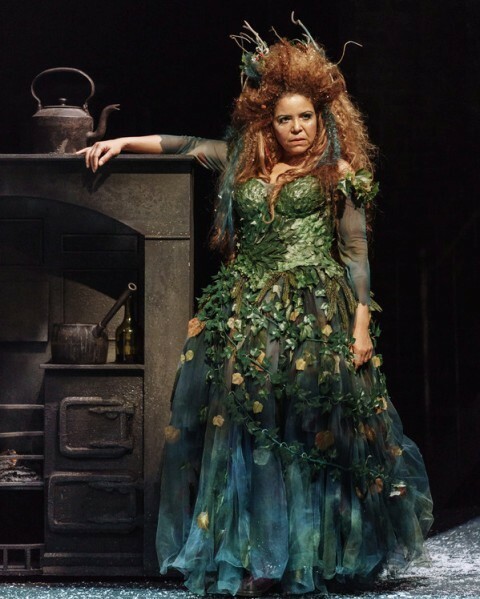 This multi-layered RSC production is well balanced with joy, hardship, redemption and festive spirit. It makes you appreciate what you have all the more. This new Christmas Carol is a marvellously sentimental show that carries the spirit of Dickens' imagination and campaigning work down the ages. It's a real joy for those of you lucky enough to get a ticket.